The Mobility system of the M.O.P Rover comprises of four elements. Lets look at how the M.O.P Chassis addresses each of these areas. While this may not seem the most efficient way to power the wheels (See YogiCub for an alternative method) it does allow us to modify each part of the Mobility system independently without having to re-design the whole rover. 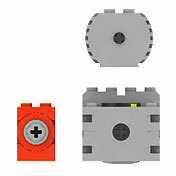 The most common drive motors used in mobile LEGO Rovers (and many other applications) are the 9V Technic Mini-Motor. These little beauties have internal gearing and are very efficent when powered from the RCX – They are an ideal choice for an all round drive motor. However there are many other types of LEGO motor available, and luckly for us, the Motor bay allows for different motor fixing methods. 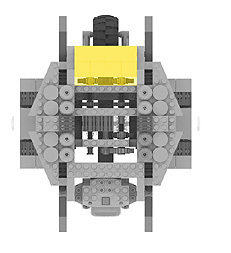 The older LEGO 9V Technic motor,or the newer transparent Geared Motor, would be the most obvious alternatives, each having specific perfmance characteristics however it is not inconceivable to mount a RC Race Buggy motor into the chassis (as long as it had a tethered power supply). Check out Philippe Hurbain’s massive motor comparison to see what each motor has going for it. No two electric motors have the same efficiency. When comparing motor one will always spin a little faster, or slower than the other. In some motors this variation can differ up to 12%. Meaning one motor might turn at 200RMP, and the other at 224RMP. This might not seem a problem until you place each motor into a drive train to power your wheels. The result means that each wheel will turn at a slightly different speeds. Your Rover will ALWAYS veer off-course and never drive straight. use matched motors with similar RPM. Have the RCX monitor both outputs (RPM) and trim power to each motor as required. Use a differential in an "adder" configuration to average the outputs of the motors. Drive all your wheels through a single drive train. Copyright © BrickVista 2004. All rights reserved. BrickVista is a completely unofficial, fan created web site showcasing models created using official parts produced by the LEGO® company. All trademarks, service marks, and copyrights are property of their respective owners. LEGO®, Technic, Mindstorms, Robotics Invention System, and RCX are trademarks of the LEGO® Group of companies, which does not sponsor, authorize or endorse this site. Visit the official LEGO® website at http://www.LEGO.com. All photographic images of Rovers are supplied courtesy of NASA/JPL, which does not sponsor, authorize or endorse this site. Visit the official NASA website at http://www.nasa.gov. See legal Info for further details.